Dr. Stuart Nunnally – The Best Biological Dentist In The World? Before I knew anything about how important oral health is, I did the unthinkable. In fact when I look back on what I did now, I cringe that I actually went through with something so stupid. With everything that I now know, I’m actually pretty embarrassed that I could do something with such a lack of awareness. I’ve heard Oprah say, “When you know better, you do better”. In my case I can say that’s absolutely true. Kate and I went to Mexico to have major work done on our teeth. I had two root canals put in and a few silver mercury amalgam fillings put in because I had some cavities. And to think I went to Mexico simply because it was significantly cheaper than here in California. I sacrificed my health because of money. Sad isn’t it? It wasn’t until around 2008 that I learned about the meridian systems of the body. I learned how all of our teeth can correspond to specific organs in the body. Each tooth actually reflexes to certain organs along predefined meridian pathways. Think of these pathways like freeways and your organs might be like specific shops or destinations sitting right off the freeway. I further learned that if certain organs are unhealthy, they can reflex the other way and cause tooth problems. I bet you never thought that you could get a cavity in a certain tooth because your liver is clogged up and unhealthy did you? Our bodies are indeed “Fearfully and wonderfully made” aren’t they? These 3 dimensional energetic ecosystems (surrounded by plasma energy) are indeed the most sophisticated and complex organisms in the entire universe. Unless we find alien life which I’m sure is much more advanced…. I believe we are only scratching the surface in terms of what they’re capable of as well as our true understanding of them. In 2010 I had the opportunity to get my mercury fillings removed which I wrote about in this post. 4 years later I had the amazing opportunity to get my two toxic root canals pulled and 4 infected cavitations cleaned up and fixed. We had the wonderful opportunity to interview Dr. Stuart Nunnally about his practice and his own story of health. If you’re interested in hearing him speak, you can listen to that show here. You can also listen to Kate and I talk about this experience by clicking here – (Fast forward to 14:11). For those that might be thinking what the heck is a cavitation? A cavitation (which “regular” dentists still don’t fully recognize) is an area of the gum and tissue that becomes infected as a result of having a tooth pulled. Traditionally this happens when people get their wisdom teeth removed. The gum, tissue, bone and jaw becomes infected with toxic bacteria and all manner of incredibly dangerous poisons that the body cannot send white blood cells to. The gums grow over the infection and create an environment that supplies to blood flow or oxygen to the area. According to many studies 70 to 90% of all cavitations are infected. These toxins make their way throughout the body and damage organs along the way. Essentially having root canals and cavitations places a constant burden on your immune system 24 hours a day 7 days a week. There’s a part of your immune system that’s “always on” and always working to fight back these toxic poisons. Imagine going to the gym and doing a set of bicep curls but doing them forever without taking a break. Eventually your body is going to break down and wear out long before it should. This is what’s happening with infected teeth. As you can imagine your health is critically important and you don’t want to have just any old dentist do this kind of work. You need to have a top level cutting edge dentist do this with the proper care and precaution. 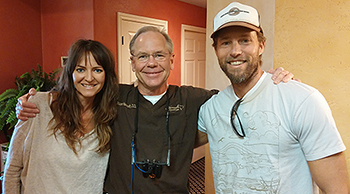 Our dentist, Dr. Stuart Nunnally is in my opinion the top biological dentist in the world. Not only do you get the top level care from somebody who’s always learning and always staying on the cutting edge, you also get the most kind hearted compassionate man that genuinely cares about you, doing the work. He took a moment before the surgery to pray for me. I mean what dentist is going to do that? The moment you walk through the door at their office, you’re welcomed by name and a sweet smile. Immediately you feel at ease and you’re in good care. It’s almost like the energetics of your body says, “Yes, I’ve come to the right place. I’m in good hands now” as soon as you enter their building. It’s not often one can combine cutting edge technology, skill and bedside manners in one place where you feel completely at home. I cannot recommend Dr. Stuart Nunnally, Dr. Freeman and Dr. Owens enough. We flew from California twice to see them because we know just how important it is to have these kind of dental procedures done right. We also had many people scratch their heads because we flew halfway across the country to see a dentist. But when you understand everything we do about dentistry (and we probably understand 1% of what Dr. Nunnally knows), you’ll see why we could go to such measures to get our teeth done by the best in the world. If you’re considering going to a biological dentist, I would HIGHLY suggest you visit Dr. Stuart Nunnally and get your work done by him and his staff. They’re incredible and we made such amazing friends there. After 3 days of procedures we feel like they’re all family. We understand that biological and holistic dentistry is pricey. They do accept Care Credit. Personally I would apply for Care Credit, get the highest limit you can get and simply pay off the procedure over time. Your health is too valuable to mess around with. I’d like to add a couple more resources if you’re new to this entire understanding of whole body dentistry. I would recommend listening to all the shows in our dental section as well as reading this book called Cure Tooth Decay by Ramiel Nagel. And if you’d like to take your understanding a step further I would HIGHLY suggest you grab a copy of The Healthy Mouth Summit to truly dive into all of the aspects of holistic dentistry at a much deeper level. But if you have already made up your mind and want to go to the best, here’s Dr. Nunnally’s website or you can call (830-693-3646) and take the first step towards greater levels of health than you ever thought possible.